To be more agile, cost effective and responsive to their business needs, organizations of all sizes are steadily marching towards the phase of either being in Office 365 or getting there. However, apart from all the advantages and features it provides, Office 365 brings increased complexity and additional challenges to the business processes related to management of user identities and access. Office 365 management becomes yet another new challenge to overcome and adds even more tasks to an already full plate of things to do. One of the major problems that emerge is how to get users into the organization's Office 365 tenant and how to grant specific users access to the Office 365 services they need to comply with their specific duties. The foremost essential step to achieve the much desired cost efficiency and operational agility is to automate Office 365 management tasks wherever and whenever possible. 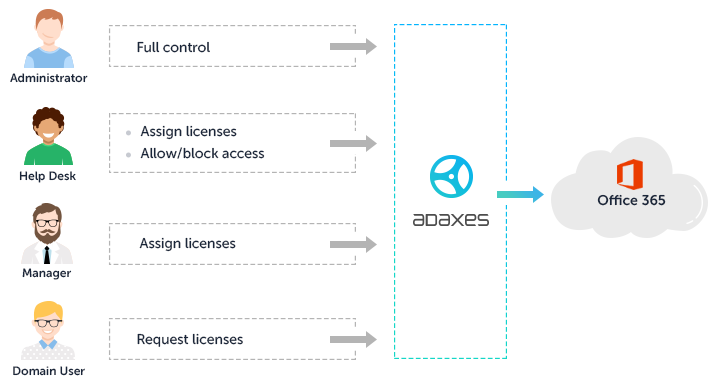 Adaxes delivers the missing layer of automation and policy enforcement needed to sustain the compliance and efficiency goals. Since Office 365 has no intrinsic means to automatically assign and revoke Office 365 licenses for users, the burden of user provisioning for Office 365 services falls completely on the shoulders of technical services staff. But what does this mean in practice? It means that every time a new person joins the organization, somebody needs to take care and manually assign all the necessary Office 365 licenses to them. Which licenses to assign usually depends on the responsibilities and role of each particular person. When the responsibilities or role change, the no longer needed licenses must be revoked and the licenses required to fulfill new duties must be assigned. If someone leaves the organization, their licenses must be freed for somebody else to use. No need to say that doing it manually is cumbersome, error-prone and requires a great deal of time and legions of expensive staff. The beauty of Adaxes lies in the automation. Using condition-based rules, you can completely automate user provisioning for Office 365. When a new user account is created in the on-premises Active Directory, strictly following the rules, Adaxes will automatically activate the user in Office 365 and assign all licenses the user needs. Automated provisioning is only the beginning. Adaxes also provides dynamic reconfiguration and lifecycle management for Office 365. When the role or responsibilities of a user change, modifying properties of the user's account, adding the user to a group, or moving the user to another Organizational Unit will automatically adjust the licenses assigned to them in Office 365. When a user gets deprovisioned, Adaxes will automatically revoke all Office 365 licenses associated with the user and block the user's access to the corporate Office 365 account. When talking about automation for Office 365, there are two aspects that go hand in hand — automated management of Office 365 accounts and automated management of Office 365 mailboxes. 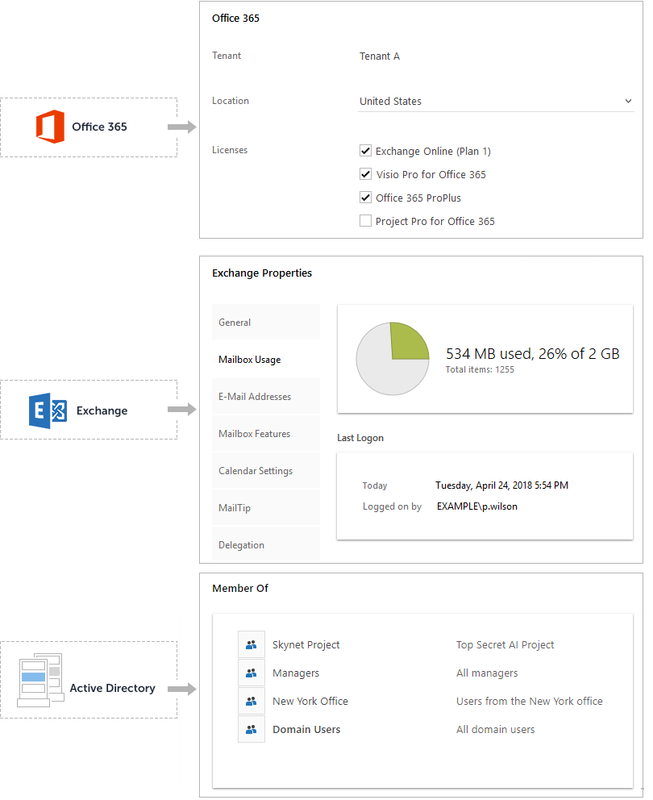 The ability of Adaxes to automatically configure Exchange Online mailboxes covers the second aspect and completes the Office 365 automation process. Based on event-driven rules, Adaxes can automatically enable or disable mailbox features, assign policies, adjust mailbox quotas, configure mail forwarding, etc. For example, when a new mailbox is created in Office 365 and the mailbox user is a member of a specific group in Active Directory, Adaxes can automatically enable Unified Messaging for the mailbox. In addition to multiple tools and applications used to manage the on-premises infrastructure, Office 365 adds yet another set of tools for administering cloud-based user accounts and mailboxes. Thus, administrators have to switch between different apps and tools to manage user identities in Active Directory and Office 365, configure local Exchange mailboxes and mailboxes hosted in Office 365. Adaxes unifies Office 365 and premises-based environments under a single console and makes it possible to manage both Office 365 and local user accounts from a single web-based interface. 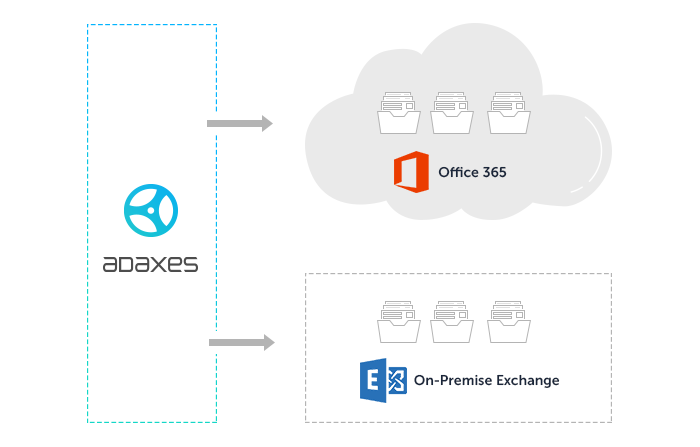 Adaxes supports pure cloud and hybrid deployment scenarios, which provides the ability to manage Exchange mailboxes in one environment, regardless of whether a mailbox is located in the on-premises Exchange or in Office 365. 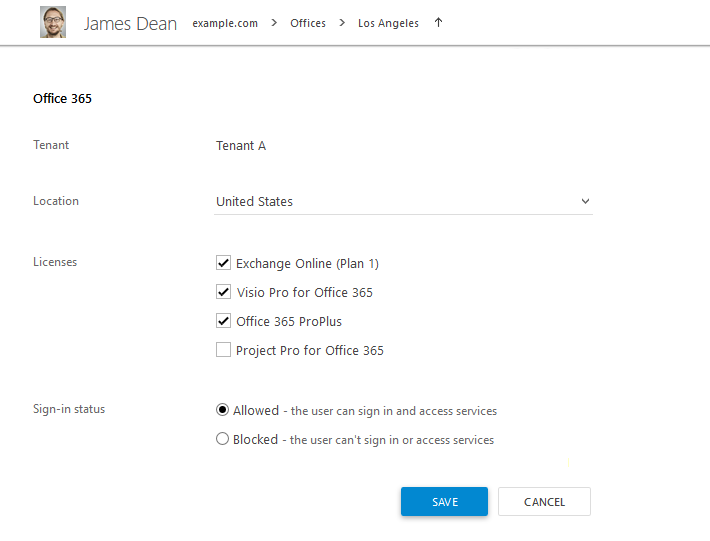 The use of Role-Based Access Control in Adaxes allows more users to have a say in the administration of Office 365, makes delegation of Office 365 management tasks much easier and gives a higher yield on the return on investment of Office 365. Applying the principle of least privilege, administrative tasks related to the management of Office 365, along with the tasks related to Active Directory and Exchange management, can be delegated granularly without giving anyone more access than needed. When delegating tasks to managers and other non-technical people, it is very important to give them a simple and clear user interface that would allow them to do only what they need to do, and nothing else. Adaxes provides an easy-to-use administrative web interface with a customization flexibility that can meet any requirements and business needs. To reduce the time taken to get access to Office 365 services and increase the use of self-service, regular users can be given the ability to choose which Office 365 services they need. To control the process, access to the desired services can be granted only after getting an approval from the user's manager or another person in charge. 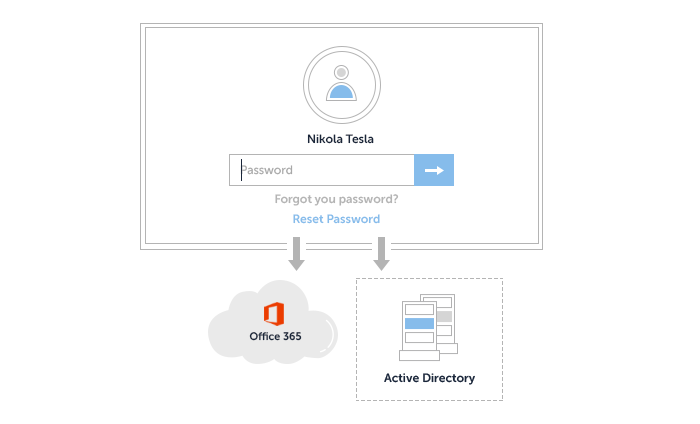 If Adaxes is configured to synchronize passwords between Active Directory and Office 365, the Self-Service Password Reset feature can be used to reset forgotten passwords in Office 365. The architecture of Adaxes allows you to manage multiple Office 365 tenants in one administrative environment. An Office 365 tenant can be associated with users and groups located in specific Organizational Units, members of groups, objects located in an Active Directory domain or multiple domains across multiple forests. Apart from Office 365 management and automation, Adaxes also provides a comprehensive range of means for automated Active Directory and Exchange management, which you can quickly and easily transform and adapt to your infrastructure.